Playa Negra is a powerful reef/point break and is one of the best known surf spots in Costa Rica because of the hollow barrels that it can pump out, especially when the surf reaches a couple of feet overhead. Negra can hold waves up to triple overhead that are perfect. 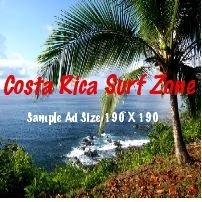 It is also one of the most crowded spots in Costa Rica and is very competitive. Playa Negra is best at mid to high tide with a south/southeast swell and an east wind. It works best when waves are headhigh, and very playful, to 2 to 3 feet overhead. Playa can produce what can only be called epic waves when the conditions are right. Playa Negra is just south of Avellanas with limited or no opportunity for accomadations. Tamarindo will be you best bet for a place to stay and food.